The Campanil staff discusses what Hillary Clinton’s possible presidency means for feminism. The Campanil Staff discusses Donald Trump’s comments in a tape recently brought to surface where he talks about sexually assaulting women. The Campanil talks about the accountability of police officers when it comes to body cameras. 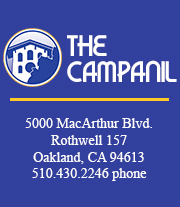 This week, The Campanil Staff discusses the proposed soda tax in Oakland. The Campanil staff discusses the option of voting third party this election. The Campanil looks favorably upon the new law making contraceptives more easily accessible, but it has a ways to go.